"This imaginative book takes the complex life of Michelangelo as a mythic model for gaining insight into your own creative life. By reading it you may find that you, too, can be extraordinary and creative." --THOMAS MOORE, author of Care of the Soul"[A] life-changing book. With its real-life stories and accessible strategies, readers everywhere will have the chance to unlock their potential, overcome obstacles, and achieve real dreams." --LESLIE LEVINE, author of Wish It, Dream It, Do It"This inspiring book demonstrates how ordinary mortals can emulate history's greatest artist to reinvent their lives and create their own personal masterpieces. A must-read for anyone who has ever yearned to change his life but fears he has neitherthe tools nor the raw material." --LORRAINE GLENNON, coauthor of Those Who Can . . . Teach!Whether you're trying to find your passion, make a dream come true, or face a major career change, there are lessons to be learned from the life of Michelangelo. The world's all-time master of sculpture, painting, and architecture, Michelangelo had the unique ability to "see" a masterpiece inside a block of stone--or hidden in the curves of a chapel ceiling. Then, with astonishing purpose and drive, he would bring his unique vision to life. There's a masterpiece inside of you too. It's the life and career you've always wanted, buried beneath layers of doubt, fear, and untapped potential. All you have to do is "see" it--and release it--with The Michelangelo Method. 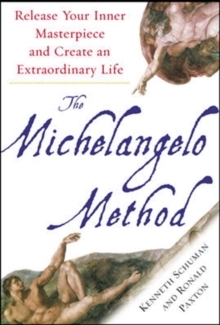 Created by two career and life coaches who have helped countless people change their lives--with a little help from the great artist himself--The Michelangelo Method is a remarkable step-by-step guide that will show you how to master the same creative strategies that inspired the statue of David and the paintings on the Sistine Chapel ceiling. Michelangelo approached every aspect of his life with passion, commitment, and courage. By applying these principles to your own life, you'll quickly learn how to:Open your eyes to the skills, strengths, and values you already possess Turn your secret passion into a lifelong commitment Take your career to new levels of personal achievement and joy Design and live a life that fits you Filled with colorful real-life stories, insightful self-assessments, and an invaluable appendix of exciting career resources, The Michelangelo Method will help you to release your inner masterpiece--and live your life artfully, meaningfully, and joyfully.